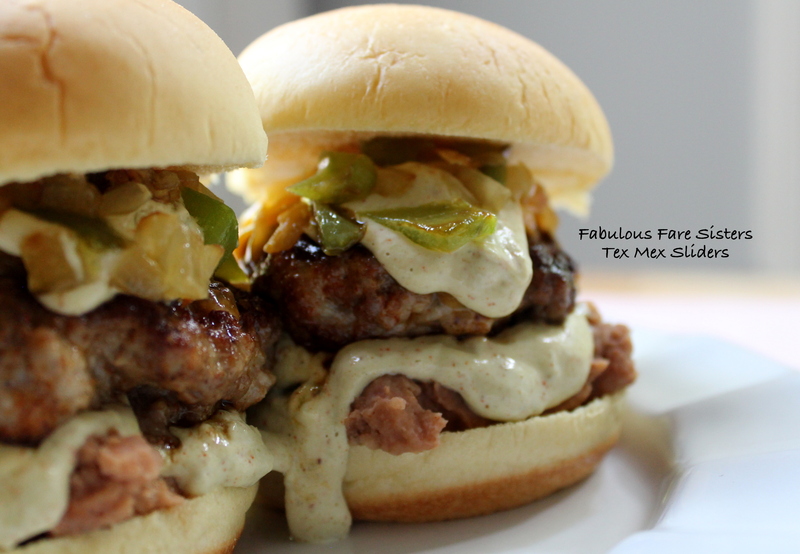 The boys were in the mood for a burger…so I surprised them with these little Tex Mex sliders that combine spices and veggies, refried beans and Avocado Crema…yum yum yum!!! Season the meat mixture with the cumin, chili powder, paprika, coriander & salt. Shape into 6 small slider burgers. Heat the olive oil in a medium saucepan and sauté the green pepper and onion until tender (6-8 minutes). Heat the refried beans. Heat a grill pan; spray with cooking spray. Grill slider burgers 4-6 minutes on each side until desired degree of doneness; place some shredded yellow cheddar cheese on top of each slider during final minute of grilling. Make the Avocado Crema. Using a whisk, combine all the ingredients in a bowl until creamy. Scoop a spoonful of heated refried beans on each potato slider bun bottom. Spoon on some Avocado Crema. Layer with grilled burger, a little more Avocado Crema and the sautéed green pepper & onion mixture. Top with slider bun. Take a big bite of this little burger! delicious Linda – my husband would be in burger heaven with these! Those look so good! Printing this one! We’ll have to make these soon! They look delicious! That looks very well! Definitely something I would try 😍 very nice!